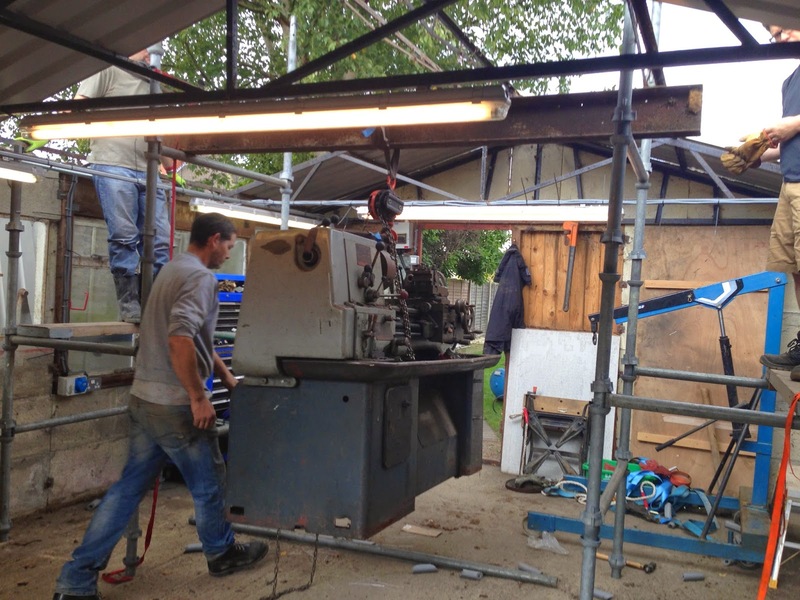 New Workshop - Lets make some space. Lathe suspended in the air. All of the below took place a few months ago but my day job was so busy I never got round to posting this. Finally I had a quiet day to write this up, so here goes! In many respects the aspect of building my new workshop I was most concerned about was emptying the old one and finding somewhere to put everything. Luckily I managed to negotiate access to a lockup garage on a near by street where I can store everything for a few months. With that problem sorted the next one was how to move everything. I investigated hiring a man with HIAB to come and move the lathe etc for me but the cheapest quote I got was over £300 which was way out of my budget. With that idea discounted I considered hiring or purchasing a lifting gantry, something I had hired when I moved everything from my parents house three years previous, but the price for the weekend hire was coming out not shy of the price for the HIAB and as is always the way there were none coming up on eBay anywhere close enough to collect. 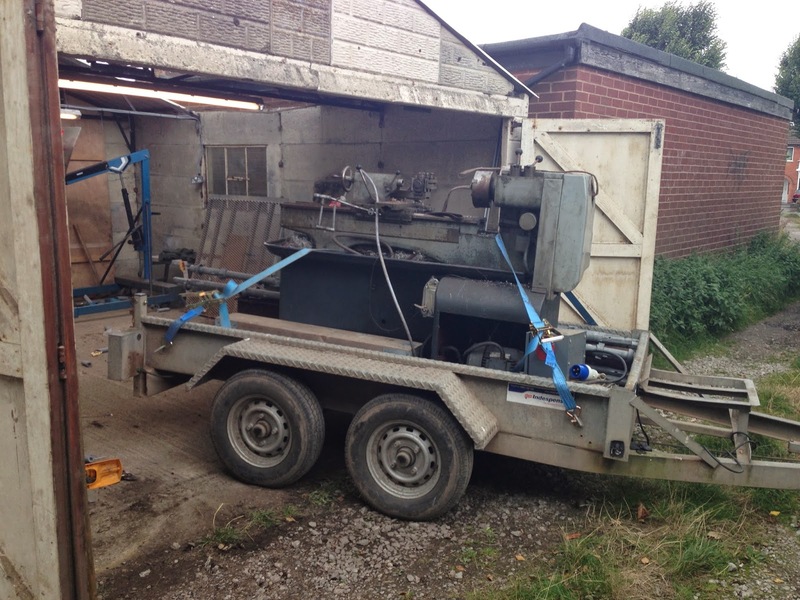 Lathe loaded on the trailer. Finally I decided the only sensible and above all affordable option was to put something together out of stuff I either already had or could borrow from friends. I was able to borrow some Cuploc scaffolding and I already had a length of I beam and a chain block. With these I built a couple of towers to support the beam to hang the chain block. The only major down side to this approach was that it quickly became apparent that our lifting structure was to high to fit under the roof so we had to remove the roof sheeting earlier than we had intended.To move the lathe a friend was able to borrow a heavy duty plant trailer which combined with his Land Rover Discovery was more that up to the job of moving the lathe. Starting to dismantle the garage. Finally it came time to take down the garage, we decided to forgo the spanners and go straight for the angle grinder for nearly all the bolts as most of them were rusted solid! 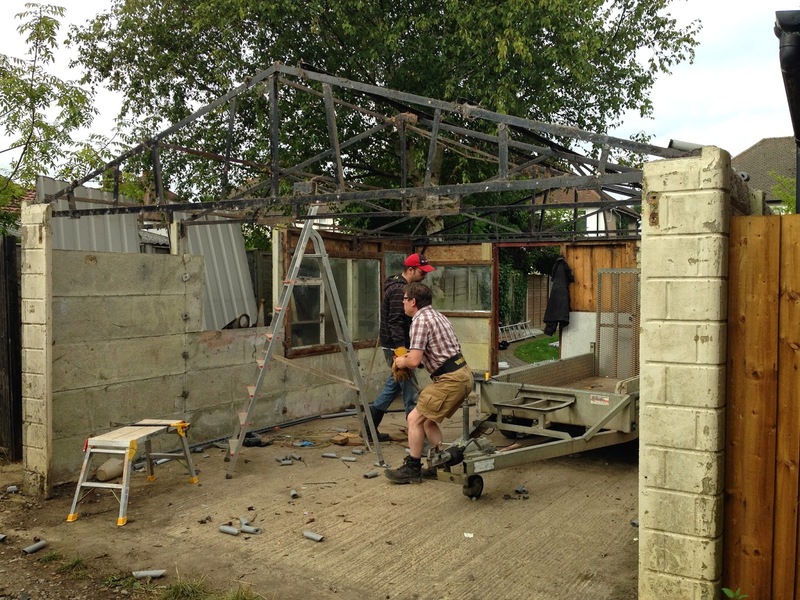 It was then just the hard work of lifting the panels down and loading them into the trailer. Whilst you could pick up one of them on your own it really helped to have plenty of helping hands around especially when it came to moving the corner panels which were definitely a two or even three man lift. So with the garage gone all that was left was to secure the site. 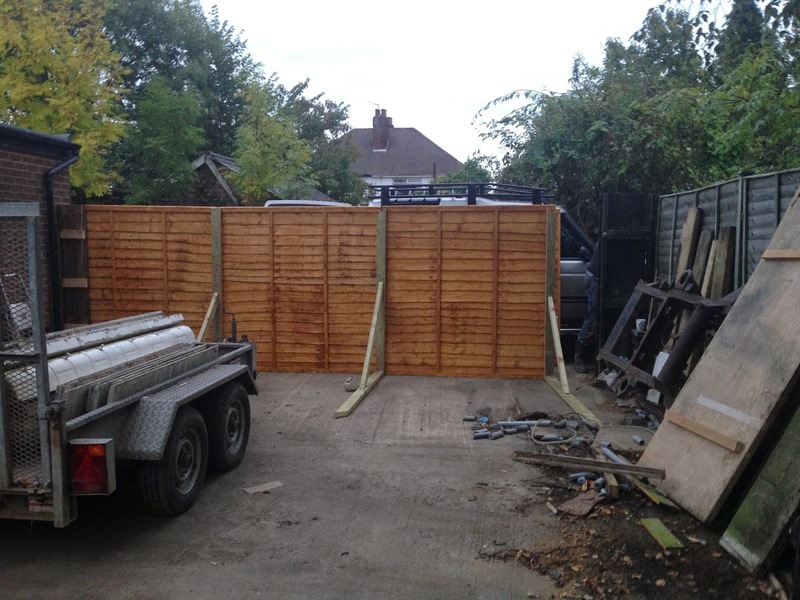 I had intended to buy some Heras temporary site fencing but I never got around to it. So on a Sunday afternoon the only option was to pick up some fence panels and make some big free standing brackets to support it, job done! In total all this took three days, one to empty out all the small stuff, one to move the heavy stuff and finally one to move the garage its self which a friend took off my hands. We have already made a start on the foundations, I will post about these soon.